Sending our love to Vlad. When Vlad arrived at our centre, the medical staff and doctors spent a lot of time getting to know him better. 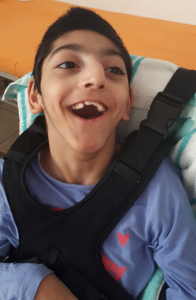 They monitored his behaviour and needs so that they could learn as much as they could and provide appropriate care, nutrition and an emergency protocol according to his diagnosis. In his case, he required a nasal-gastric tube to ease feedings, so he was taken to the hospital to have one attached by a team of specialists. Vlad suffers from muscular atrophy and he struggles a lot. He also has respiratory problems. Breathing and swallowing are things we all take for granted but for Vlad these are bodily functions which are difficult to handle. Earlier this week, Vlad was admitted to the Pitesti Paediatric Hospital due to respiratory failure. Unfortunately he did not respond to prescribed treatment and his condition got increasingly worse. His paediatrician and a team of specialists decided to perform a tracheostomy, this operation being the best solution in his situation. The operation was successful and Vlad was fitted with a tracheal cannula which helps him to breathe. At the moment, Vlad is stable but he will stay for an indefinite period at the Paediatric Hospital in Pitesti. We will keep Vlad in our prayers and in time, we hope he will return to the centre where his friends will be waiting for him. Bianca continues to amaze us with her determination and kindness. Spring Cleaning and getting ready for a new season full of hope! Child sponsorship is a wonderful way to bring hope and change to a child living in poverty. Registered Charity Number: 1001327. Scottish Registered Charity Number: SCO 39383.